Relaxing body treatment oil formulated with 100% pure plant extracts to help relieve stress and fatigue. 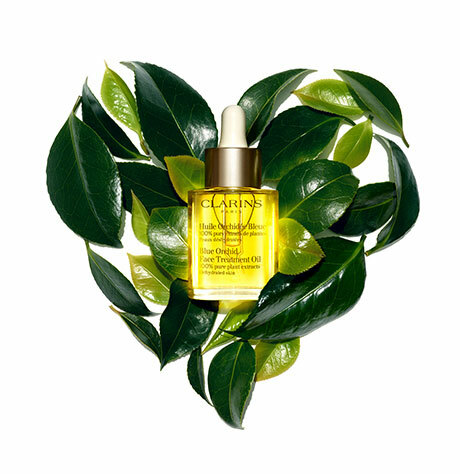 Relaxing body treatment oil, formulated with 100% pure plant extracts, creates a total feeling of wellbeing. An aromatic blend of essential oils—including Basil, Camomile, and Bitter Orange—helps relieve stress and fatigue, and soothes tired, aching muscles after exercise. Hazelnut oil, rich in Omega 9 and Vitamin E, locks in moisture to smooth skin from shoulders to toes. Fine, lightweight formula absorbs instantly. Won’t stain clothes. Preservative-free. Dermatologist tested. Massage a small amount onto dry or damp skin, concentrating on tense areas: neck, shoulders, solar plexus and back. Rinse with cool water. Rated 5 out of 5 by Clair from I have used Clarins body and face oils for about 30years. I absolutely can't be without them. My favorite is Relax. Rated 5 out of 5 by Ellie58 from Lovely Lovely oil for pm. Does have a scent that is relaxing to me. Hydrates. 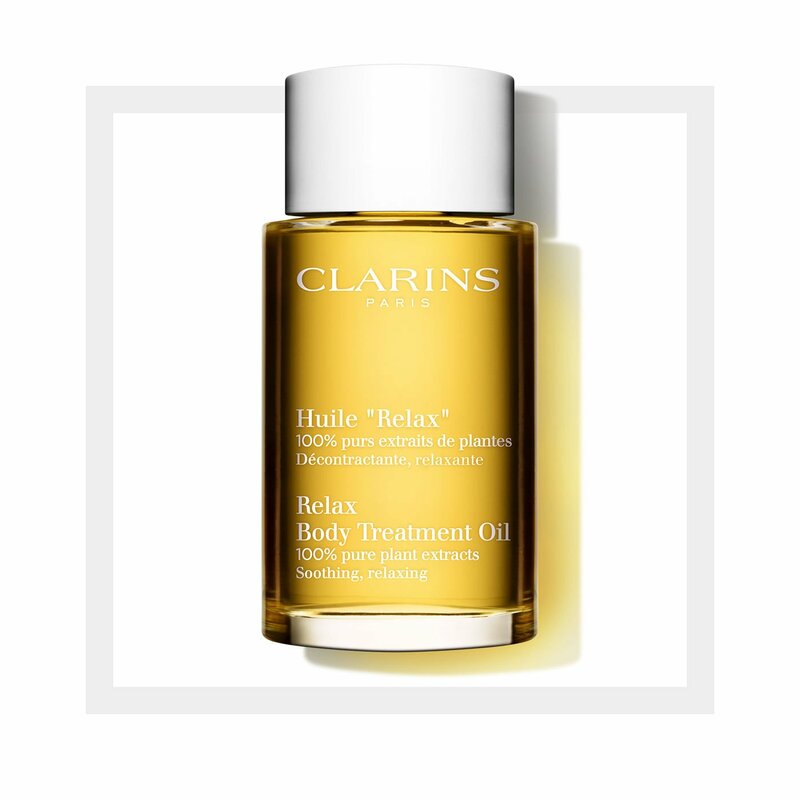 Rated 5 out of 5 by Giuditta17 from Huile Relax Massage Oil I am truly grateful to Clarins for bringing back my Huile Relax to Clarins's website where I may purchase directly rather than going to a department store PRAYING it is in stock! Not only does this oil put my insomnia straight to sleep no matter how hard insomnia fights to win, but as a Medical Massage Therapist this oil is my choice of use and works wonders for my clinical clients' skin and overall well-being. For my own use I use this oil after my showers before bedtime - never would I use this in the day because it really puts you to sleep! The smell is amazing! It really does penetrate into sore muscles as you feel it!! I have been a fan of this oil for years! Please, Clarins - never discontinue Huile Relax ever off uour website! Highly recommend to the max! Rated 5 out of 5 by ClarinsLoyalist from Cures Insomnia, Anxiety and Awesome post workouts Clarins' Relax Body Oil is a god-send. I don't know what in particular makes is a miracle oil for me, but I know it works like nothing else. I suffered from terrible insomnia for the past 5 years. I've been on meds and tried many different workouts and even reorganized my place to make it condusive for wholesome rests. Nothing worked consistently, until I tried this oil. I apply it before bed, and I go right to sleep and say asleep. I've been using it for a few months now. Whereas other meds would have worn off the effective by now, this oil keeps delivering with consistent results. My body seems to adapt to it. Case in-point, I also like it post workouts. It doesn't make me tired but gives my legs that "just massaged-spa" feeling. My body gets into a new gear. With this oil, during the day I'm revved up enough to keep going, yet at night it puts me in a restful state. I am now stocking up on this product as it tends to run out in the stores near me. If you (or a loved one) suffer(s) from insomnia and/or anxiety, please consider giving this a try. For me it's been a healthy decision to make the investment both financially and in terms of time. Rated 5 out of 5 by NJTechie from Spa in a bottle Always crazy and stressed? The Relax line is your best friend. Use the Relax herbal products to de-stress without a trip to a spa. Take a break, take time, relax. These products are the best thing to help relax and get ready for "you time" after a tough day. Rated 5 out of 5 by FactoryGirl from Great Product for Sore Muscles I call this the Magic Oil! It soothes sore muscles from repetitive motion jobs and helps carpal tunel. I put some on my mohter's arthritic hands and she found some relief. I'm going to try it on my legs next time I get a severe cramp and see if it helps there too. Truly remarkable for stiff necks and tension. LOVE THIS PRODUCT!!! !